Hi there, friends! 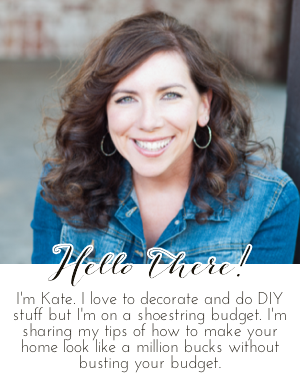 Today I want to share how to my super easy and inexpensive Spring wreath with you. I made my first burlap wreath last Fall and really liked how it turned out so I decided to make one for Christmas too. I did a burlap wreath tutorial at that time so you can see how to make the base wreath there. I wanted another burlap wreath for Spring and was too lazy to make another one realized I could easily re-use my burlap wreath by simply switching out the flower pics and stems. Since I didn't hot-glue anything to it everything came off quick and easy! That's my "Surprise, I'm in the picture!" face. I took the wreath down to take the stuff off. For Spring I added 2 forsythia stems for $1 each and 2 Spring floral picks for around $2 each, all were 50% off at Hob Lob. I had only planned on using one of each because I thought that would be all I needed but it wasn't enough. I started by adding one forsythia stem to the flattened area that had previously held Christmas flower picks. These stems are really long so you can either cut them or lace them through the wire frame in the back which is what I did. 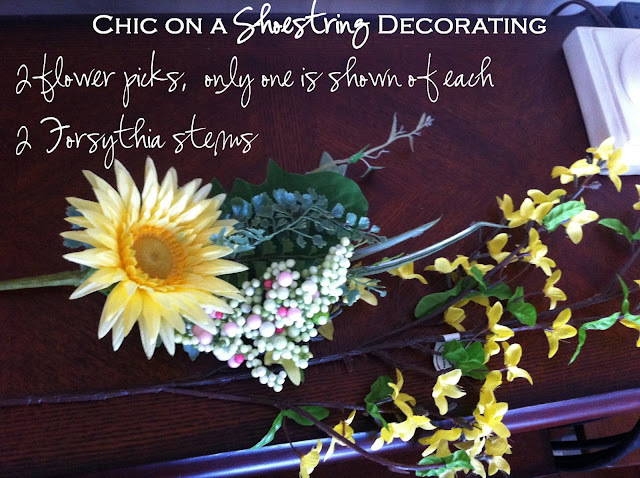 I then added the larger yellow flower pick at that bottom of the forsythia where it is inserted into the wreath frame. You can attach with pipe cleaner (shown above) or even garbage bag twist ties. Sometimes you can just lace the stem around the wire frame, some floral picks will stay but if it's too heavy you'll need something to attach it or it will fall out or change position. After I attached the first forsythia and flower picks I did it again mirroring the first set. This was just what it needed. Depending on the size of your wreath you might be able to get away with just one set. I spent about $7 making the original wreath but that was a one time expense. I spent about $6 on the Spring stems for this one. If you're starting from scratch and use the coupons and sales I mentioned the wreath will cost you a whopping $13. 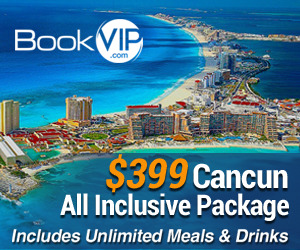 I think that's a pretty good deal! Really cute! 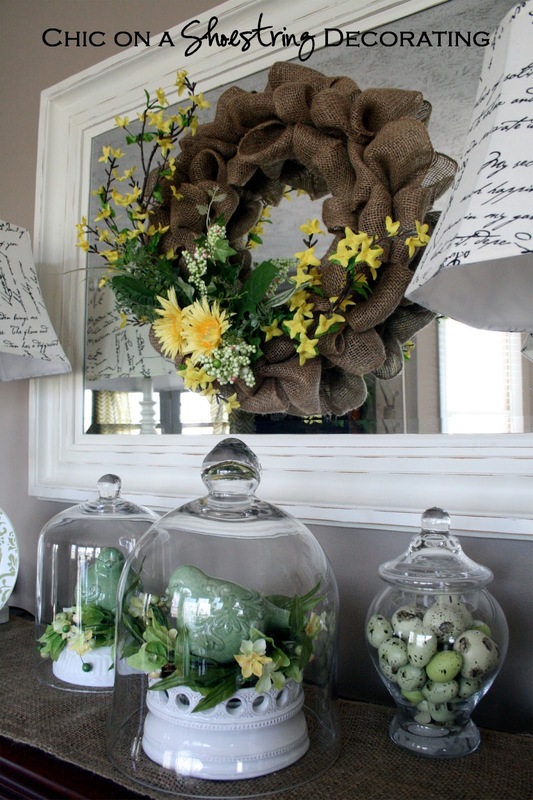 I love burlap wreaths. I had one for fall and one for Christmas, but everything was glued in, so mine wouldn't be an easy fix. That came out so pretty! My pictures weren't loading until the very end so it was like a big surprise to see the final project.Love it! 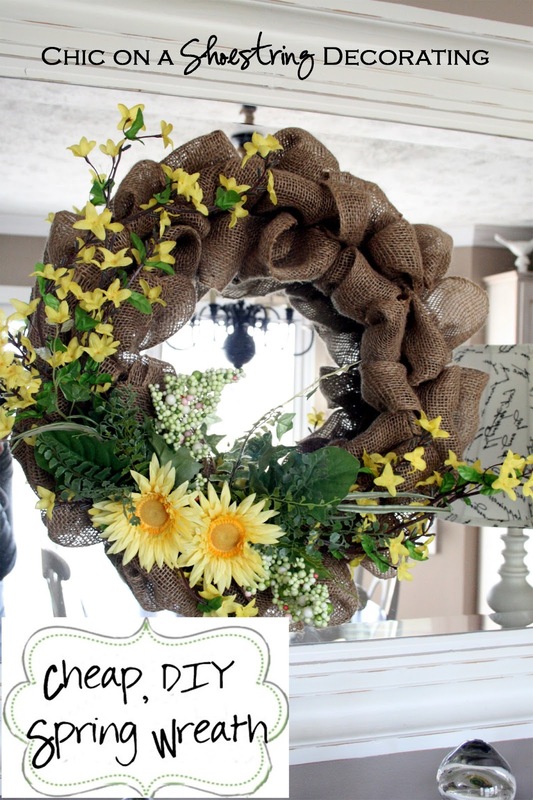 I love this burlap wreath! I've been saying for years that I need to buy or make one, and this is inspiring me to make one. I love the addition of forsythia too. Very spring-like and pretty! So bright and springy! 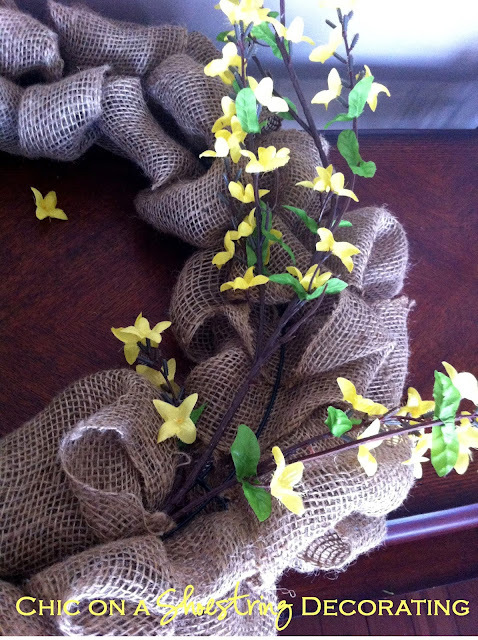 I love burlap - it can be dressed up or down with whatever you want to put with it. Your mantel is beautiful. Hello. I have been wanting to make a burlap wreath for a long time. I could build you a kitchen but a burlap wreath "NOT". I have all the fixing too. You made it so simple. Will get one together this weekend. Is it ok if I share your post. Thanks so much from a happy new follower.